We’re back into subzero temperatures; I got three! whole! days! of riding in last week when the temperatures came above single digits. It was pretty great. Then we plunged back into the arctic abyss. When it gets this cold – and by “this cold” I mean well below zero, double digits below zero, wind chills colder than -30 – there is quite simply no way to keep fresh, unfrozen water in front of a horse at all times unless you have a bucket heater. Bucket heaters and de-icers are strictly verboten at my barn, and I tend to agree with them. They make me incredibly nervous. I saw a barn fire once, and it remains one of the worst memories of my life. For the most part, the horses adapt pretty well: barn staff keeps a very, very close eye on their consumption, and each horse has a rotating system of buckets so that they get fresh water 2-3x a day. 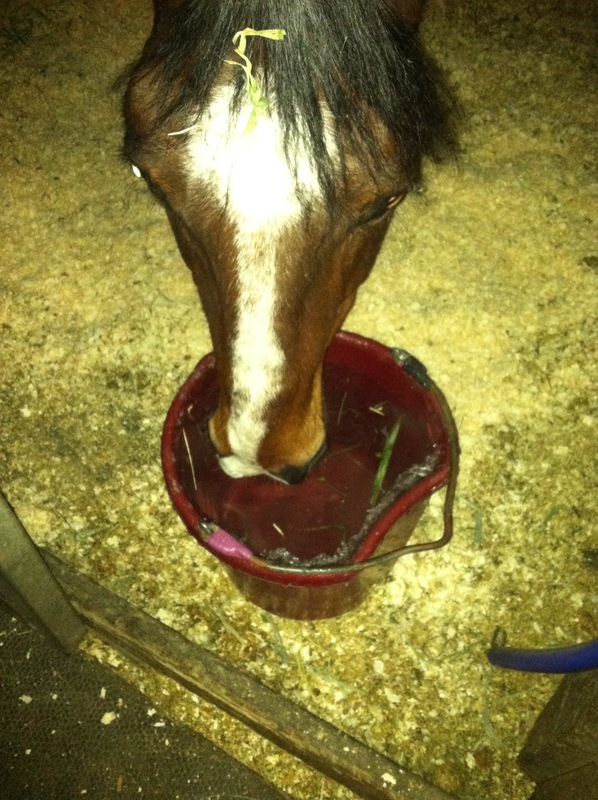 The horses learn to drink their fill when they have water. They get soupy mashes on the regular when it’s going to be painfully cold. On Friday night, I stepped up my game and bought a bucket water heater from Tractor Supply. A friend of mine has one and loves it. They’re designed not to de-ice, but really to heat the water up to boiling if left long enough. 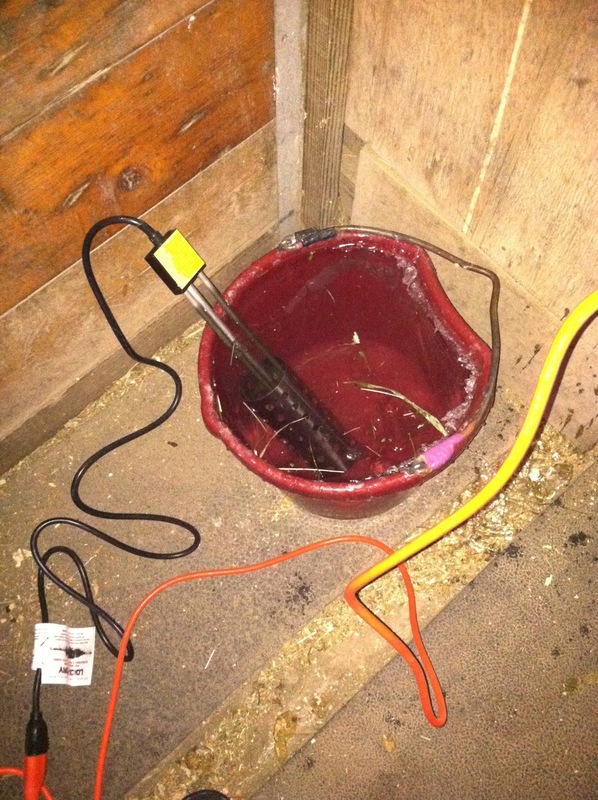 So, the new system is to pull Tristan’s bucket from his stall and put the bucket heater in it for about 10-15 minutes. I stand next to the bucket and check it constantly while I’m doing so. As you can see, it does end up melting the ice. It takes a while, but it gets the water nice and warm. I don’t think I’d feel safe really getting to boiling – for a lot of reasons! – but once the water is warm it’ll take that much longer to freeze. The other night, I was going through this system and it was bitterly, painfully cold. I’d forgotten barn clothes, and I was wearing thin pants. I wanted the water to heat up quickly. I dipped one finger, then another, and now both my hands were cold and wet even inside my gloves AND my pockets. I was impatient, and all I could think was that there had to be a way to test the warmth of the water without making me colder. So I decided to lean over and stick my tongue in. I know. Gross. But it worked! My tongue was already wet, so whatever, and it got warm again immediately, and since I already knew how to test the temperature of liquids with my tongue I had a good barometer. Another few minutes, and I brought the bucket back to Tristan. One of his quirks is that he will almost always take a sip of a bucket that is on the ground or held for him, so I put it on the ground inside his stall, and he promptly drank half of it. Score one for lukewarm water! I half-filled another bucket, heated it up again, and topped his bucket off before I left. I’m declaring the new bucket heater a success! The only drawback: even knowing it has an auto-shutoff, even carefully unplugging and triple-checking it, I still have a twist of anxiety in my gut about it. Ah well. Have you ever resorted to slightly strange and obsessive ends to make things more comfortable for your horse in extreme temperatures? Next Post What do you do for extra cash? From one frozen fingered horse girl to another … I would totally use my tongue to test the water. I am jealous of your water heater. I would like it for my shower. Ahahaha, you are the best. This sounds miserable. I think you should feel ZERO guilt about bucket heating and do it with wanton abandon. Under close supervision, of course. You are a dedicated horse mommy to give him this extra care! The tongue thing is also pretty genius. They make buckets you can plug in that are super barn safe! Another option is keeping a trough full and using a de icer, just fill buckets from there! Every barn I've boarded at in MD (including one that's been in business since the 1970's) uses de-icers in one of 2 troughs offered and have had a plug-in bucket + a regular bucket in each stall. We also do the wet warm mashes with the horses' regular grain and/or beet pulp on very cold nights. You take such wonderful care of Tristan. And the tongue trick is brilliant! !